This is another wonderful recipe from the cookbook Arabesque by Claudia Roden. 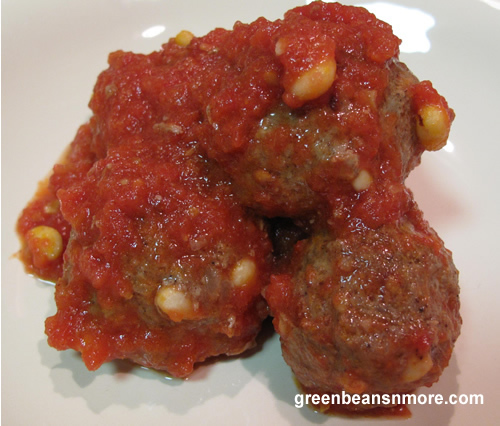 The tender and juicy lamb meatballs are studded with pine nuts and cooked in a flavorful tomato sauce. One of the best things about this recipe is that it doesn't require any special spices. If you have Cinnamon and Allspice in your pantry you're good to go! Please read my Cook's Tips before you start. Grate or finely chop the onions in the food processor, drain, and turn them into a bowl. Add the ground lamb with salt, pepper, cinnamon and allspice and work into a paste with your hands. Roll the paste into small walnut-sized balls. Make a hole in each ball with your finger, stuff the cavity with a few pine nuts and close the hole. Alternatively, and more easily, work the pine nuts into the meat paste and then roll it into balls. Put a little oil in a soup plate and roll the meatballs in it. Put them in a baking dish and bake in an oven preheated to 400 degrees for 15 - 20 minutes, until their color changes. For the sauce, cut up the tomatoes, and liquefy them in a food processor or blender. Add a little salt and pepper, the sugar and garlic (if using) and pour over the meatballs. READ COOK'S TIPS! Bake them another 35 minutes, turning the meatballs over once. Variation: Add the juice of 1 lemon and a good pinch of chili flakes to the sauce. Cook's Tips: This is not a dish to serve the same day. The flavors are much better if you let it sit a day or two. This recipe does not require a food processor. I used a standing box grater for the onions and it worked fine. Make sure you drain the fat off of the meatballs before you pour the tomato sauce over them. Our local supermarkets sell ground lamb in 1 lb packages, so I use 2 lbs of lamb. I just add a bit more salt, pepper, cinnamon and allspice. 2 lbs. of ground lamb will make approximately 35 meatballs. I work the pine nuts into the meatball mixture. I use canned tomatoes for this recipe and I weigh them after they're drained. I do add the lemon and a small amount of chili flakes as suggested. We like these meatballs wrapped in Pita bread and topped with Greek yogurt.